In a bowl, combine olive oil, oregano, dry basil, garlic, salt and pepper. Place chicken and shrimp in another bowl; pour over marinade. Cover and refrigerate overnight. Heat about 1 tablespoon marinade in frypan over medium heat. Remove chicken and drain; add to pan and cook until lightly brown. Remove from pan; set aside. Add sausage to pan; cook over medium heat until well browned. Add onions and green pepper to pan; raise heat to medium-high; cook until vegetables are soft. Stir in rice; brown slightly. Add broth, tomatoes, saffron, coriander, chicken and sausage; boil, cover, heat and simmer for 25 minutes, stirring occasionally until rice is tender. Add peas and scallops; toss gently. 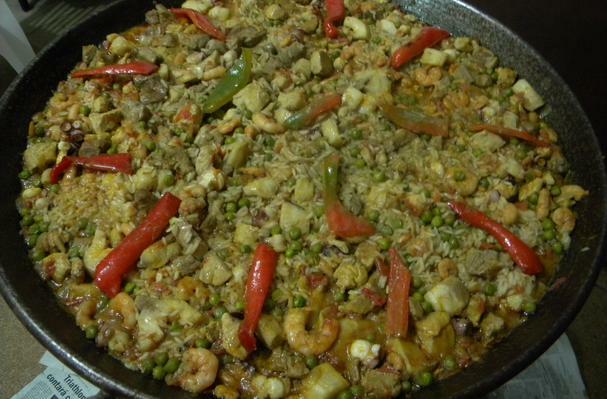 Transfer Paella to large ovenproof 6-quart baking dish or paella pan. Drain shrimp; push into rice mixture along with clams. Bake, covered, in 350 degrees oven for 15 to 20 minutes, or until shrimp are pink and clams open. Garnish with pimento strips, if desired. Paella is a Spanish dish widely thought to have originated the City of Valencia, though popular throughout Southern Spain.